Nor is it an email killer. Facebook users will be bestowed their very own @facebook.com address, but you still shouldn’t mistake Facebook for email. That’s the official story. From the sender’s end, the entire experience is going to be more geared towards a chat experience. There are no “subject lines, no cc, no bcc, and you can send a message by hitting the Enter key,” says Facebook. Instead of punching in their email address, you just click on their name and send, much as you do with Facebook Messages now. And then, the recipient receives the message in the way that’s convenient for them—be it email, SMS, chat or Facebook Messages. The only reason you get an @facebook.com address is so people who don’t have Facebook accounts can still contact you. To prevent you from being bombarded by spam and other unwanted junk, all messages from anyone other than your Facebook friends gets plunked into the “other” folder. Later, if you decide the person is worthy, you can promote them out of the other folder and into the inbox. The goal here—and I admit, it’s a somewhat noble one—is to bring the conversation front and center without worrying about how your message gets there. For example, you could be sending Facebook Messages to one of your pals, and he could respond by SMS and it wouldn’t make all that much of a difference. Likewise, your grandma could email you from her earthlink.net account, or whatever it is she’s been using since 1994, and you’d receive her email in your Facebook Messages inbox. Meanwhile, Facebook Messages keeps an ongoing conversation history, regardless of medium. So, that’s Facebook Messages in a nutshell. It’s a pared down way for you to strike up real-time conversations without worrying about whether to send it to someone’s cell phone, inbox or chat window. Plus, it’s strictly social—you have to handpick which correspondences from outside of your Facebook network get into your inbox. 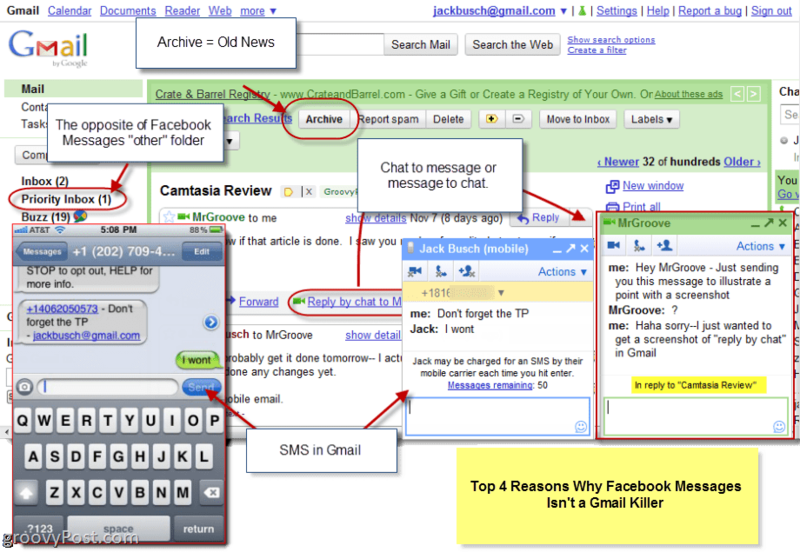 And there’s one big reason why I think all of this is overhyped: Gmail’s already been there and done that. Seamless, conversation-based messaging. Gmail really pioneered the threaded “conversation-style” replies, and I for one like it a lot. 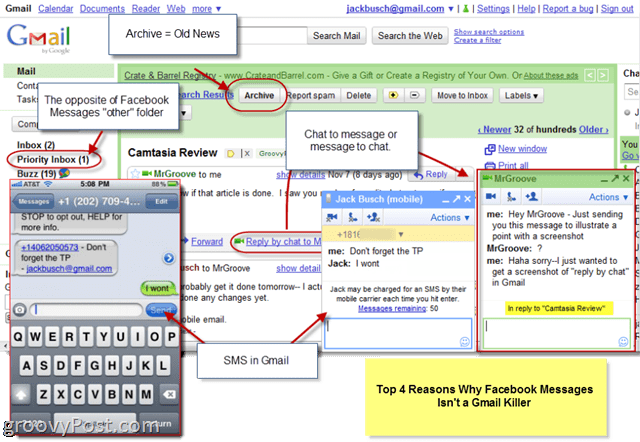 But that’s not all, Gmail also makes it easy to switch from an email to Google Chat or even voice or video chat. And it works great—MrGroove often emails me an article idea or something and, if I’m around, we go right into a Google Chat conversation and talk about it in real-time. Or, if I’m away when he sends a Google Chat message, I can reply by email later. Archived conversations. Facebook gets really misty over the notion that you can have your entire conversation history saved, from “hey wanna get some coffee” to “can you pick up the kids from soccer?” But Gmail’s had that covered since its inception. SMS and texting. Chatting computer to SMS or SMS to computer is nothing new. Gmail lets you do it from Gchat, and Verizon users can receive emails as text using their custom vtext.com email addresses. You can also send people SMS messages via Windows Live Messenger. But I see this being ultimately moot—if we’re talking about high schoolers and their cell phones three years from now, then it’s a foregone conclusion that they’ll have chat clients built-in anyway. It doesn’t make sense to carry on a conversation at $0.05 per message when you can chat for free over Google Talk or Facebook’s mobile app or Skype or Fring. Rigorous inbox gatekeeping. I don’t even see Facebook Messages’ “other” box as a benefit. It sounds like a pain. It’s like if your spam folder were ultra-paranoid. And it completely defeats the purpose, since you’ll be constantly checking your other box for messages that might be relevant. Meanwhile, I never check my Gmail spam folder, unless someone mentions a message that never made it through. The winning combination of Gmail’s Priority Inbox and spam folder works for me. And that whole thing about not wanting an email from your grandma sandwiched between two utility bills—I don’t even know what that’s about. That just means that if you want to do business or manage your life electronically, you’ll have to have Facebook Messages AND an email account. Sounds less convenient to me. And I don’t know what Facebook means when they say that this kind of control is “unprecedented.” I’ve been filtering, blocking and setting up email rules with Outlook and Gmail since the heyday of Friendster. Overall, I do see this as a giant leap for Facebook Messages. For those who do prefer to communicate with friends and family via Facebook rather than email, this is going to work well for them. But I think those who proclaim that email, or even Gmail, is dead are getting a little over-excited. I think everyone’s getting a little over-excited, in fact, including me. Just listen to the background music and overall tone of the video explaining the Facebook Messages overhaul and it all seems a bit much. I feel almost like I’m watching one of those as seen on TV commercials, where some wonder product provides a solution for a problem that doesn’t exist for the vast majority of normal human beings. Personally, trying to remember my grandma’s email address has never been a challenge for me. Nor have I ever had any trouble keeping track of who likes to be texted and who likes to be emailed. Nor have I found it burdensome that there are multiple ways to reach someone or for them to reach me. If I’m in the grocery store, I’d rather my wife send me a text that we urgently need toilet paper than to have her Facebook me. I really feel like Facebook is going to take away a lot of these supposedly extraneous features from the decidedly un-modern modes of messaging only to incorporate them again, perhaps by a different name, when they realize just how necessary they are. I think the real benefits to get excited about are the conversation style messages, the archived history, and the @facebook.com email addresses for reaching the outside world from your Facebook inbox. But the more they talk about Facebook Messages, the less I believe that it’s not email albeit with a few tweaks for the Facebook era. I’m not saying that I won’t change my tune once I get to give it a try—hopefully, I’ll be one of the few who get access to the new Facebook Messages as it slowly rolls out to users. But I think we need to impose a wide moratorium on calling things “killers” from now on. Facebook is an important, game changing force, both socially and technologically. But Facebook’s prominence is going to be integrated into the “old” ways of messaging ( a la Outlook Social Connector or RockMelt or smartphone apps)–not overtake it.